The Buffoonery: Is that June back??? Turned on Rachel today and my how ridiculous she looked. She had a dress on.....like an attempt to be dressed in a dressy dress type dress. I won't comment on whether its a nice dress or not, I'll leave that to the more fashionable amongst us. She also had full jewelry and makeup. Rachel......you have a COOKING show. 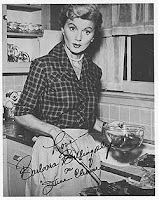 NOBODY cooks like that except June Cleaver. Are you going straight from the show to some big dinner event? Please just wear clothing that is cooking appropriate. You look like a goddamn moron.....oh wait....you sort of are a goddamn moron. Oh well....dress away.